Parishioners who have celebrated a Mass of Christian Burial, Memorial Mass, or Service at St. Christine for a loved one are welcome to use the Parish Center for a meal following that service, provided the Center is available. 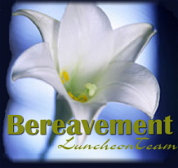 In order to meet this need, the Bereavement Luncheon Ministry was formed in 2007 – serving our first luncheon in June, 2007. The Ministry consists of seven (7) teams, one for each day of the week (Monday thru Saturday), and one reserve (back-up) team. The compassionate members willingly volunteer their time and talent to serve our bereaved parishioners during a most difficult time. The team provides: hospitality for guests, water, coffee, tea, serving if necessary, assistance with communication to caters if necessary, set up and clean up. We gladly accept new members at any time. Please contact us if you are interested in joining one of our teams.